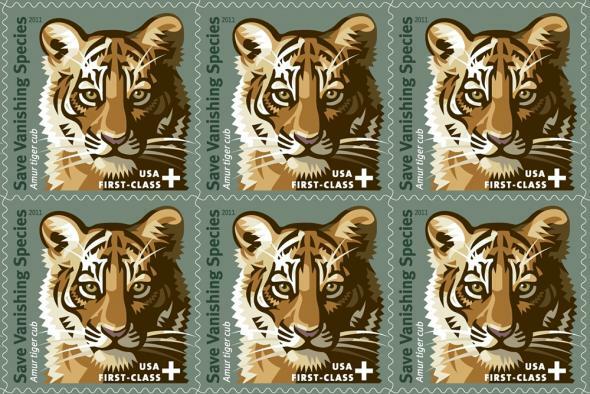 Proceeds from the Save Vanishing Species stamp go to U.S. Fish and Wildlife Service’s Wildlife Without Borders program. We're grateful in this digital age that some of you still send handwritten letters. That's because your Save Vanishing Species Stamp purchases from the U.S. Postal Service have just made it possible for the U.S. Fish and Wildlife Service (USFWS) to award nearly $50,000 to the Woodland Park Zoo-Panthera Malayan Tiger Conservation Project and Rimba, our in-country field partner. The new funding will enhance our anti-poaching efforts in Peninsular Malaysia. We have yet to discover a wild tiger roaming the United States, but that doesn’t stop the USFWS from caring about their fight against extinction. Recognizing the critical role humans play in endangered species survival and the growing need for collaboration among countries, the USFWS created the Wildlife Without Borders program to provide grants for international conservation efforts. In 1994, the Rhinoceros and Tiger Conservation Fund was developed as part of Wildlife Without Borders, and has since awarded millions of dollars to organizations working to restore wild rhino and tiger populations all over the world. In 2015 alone, the Rhinoceros and Tiger Conservation Fund awarded 47 grants totaling more than $2.5 million to organizations fighting for these magnificent animals. Now in 2016, Woodland Park Zoo and Rimba join the list of recipients to the tune of $49,915. Over the past few years, the zoo has encouraged visitors and especially Tiger Team members to purchase the Save Vanishing Species Stamp. Eleven cents from each stamp directly benefits USFWS’s Wildlife Without Borders program, and as of now, Woodland Park Zoo’s own Malayan tiger project. Not surprisingly, we’ll continue to ask you to keep purchasing these stamps! What does this grant mean for Woodland Park Zoo and Rimba, and more importantly, tigers? Rimba will be closer to two main objectives. The first objective is to track individual tigers by using images taken by motion-triggered cameras placed at hotspots where tigers have previously been detected. From these images, researchers will monitor the status of known tigers, find evidence of new tiger cubs, and perhaps capture photographs of poachers in the area. 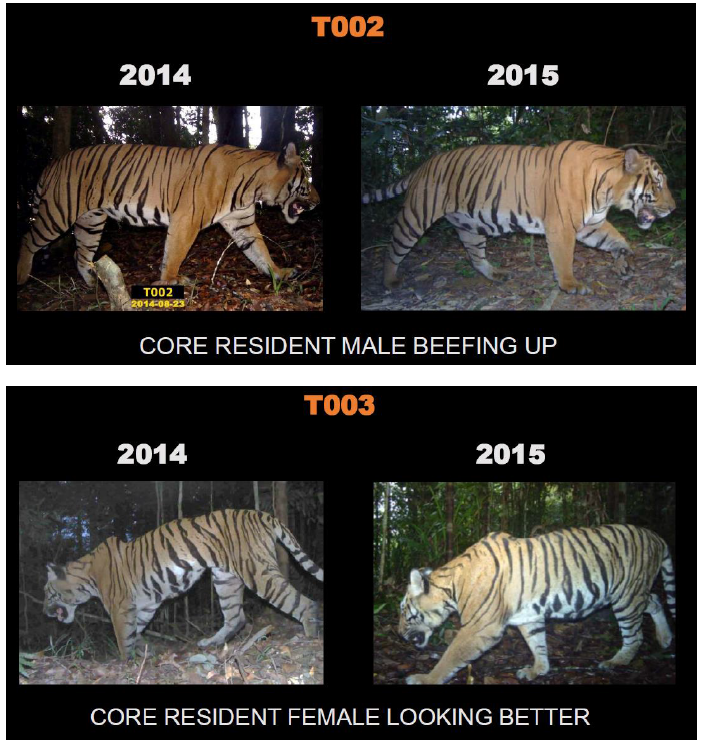 Check out these images of Core Resident Tigers 002 and 003 to show how the health of tigers is tracked using remote cameras. Researchers can identify a tiger and track his or her well-being over time using camera trap images. The second objective is straight-forward: eradicate poaching threats. The USFWS grant will allow Rimba to increase patrols at tiger hotspots to deactivate snares set by poachers. Additionally, in coordination with Malaysia’s Department of Wildlife and National Parks, a strong Rapid Response Team communication protocol will be strengthened, improving the system to quickly alert local enforcement of fresh signs of poaching. Every dollar counts when you’re fighting for a tiger’s life. Perhaps this grant from the U.S. 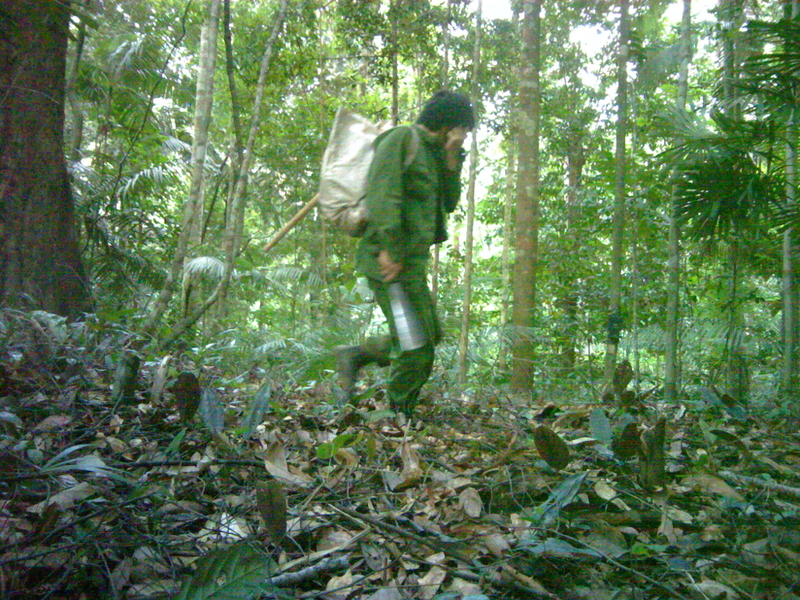 Fish and Wildlife Service will enable a patroller to deactivate a snare set to poach Malayan tiger 002 or 003, giving him or her one more day to roam the planet. You, too, can help T002 and T003 survive by sponsoring a ranger for a day, a week or a month. The U.S. Fish and Wildlife Service deserves a huge orange and black-striped THANK YOU for its commitment to saving tigers from extinction, as do YOU. Your spirit and encouragement keeps us fighting every day to protect Malayan tigers from extinction. Spending time with Woodland Park Zoo's Malayan tiger brothers will fill your heart with love for these big cats. Photo: Dennis Dow/Woodland Park Zoo.